On Reflection Eternal’s 2000 album Train of Thought, Talib Kweli challenged fans, and himself, to “do what comes naturally.” After years of recording on mainstream labels, he now has the chance to produce exactly what he wants, and feels he needs, to produce: an album straight from his mouth to the ears of his fans. Invoking the true meaning of MC, Master of Ceremonies, Talib Kweli brings incredible power to his live shows and feeds off the spontaneous energy of his audiences. 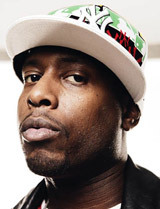 Through Talib Kweli’s various collaborations, he has been able to grow as an artist and expand his fan base. For over 15 years, Kweli has been a king of New York hip-hop who has an expansive international audience. Kweli’s work with MosDef on Black Star (1998) still stands as one of hip-hop’s premier expressions of truth. On Train of Thought, Kweli teamed up with Hi Tek to form Reflection Eternal, a virtuoso hip-hop duo that continues to wow audiences and critics alike. As a boy growing up in Brooklyn, Kweli saw gutters that ran with dirt, oil and water, revealing a shimmering rainbow to his child’s eyes. Drawing its title from this memory, this album puts at the raw center what his music has been doing for years: finding and preserving the beautiful in the hideous, the rainbows in the gutter. Weaving the lyrical and the gritty, the autobiographical with an honest, no-holds-barred hip-hop spirit, Kweli sticks fiercely to what feels true to him in creating the sound of this album. Without being tied to any particular label’s conception of what his sound should be or when his work should hit his fans, Kweli is free to build his most personal album yet in both content and motivation.